Gold Rush: 1848–1860: "I Saw the Elephant"
Or view larger version. Mountain Jack and a Wandering Miner. ca. 1851. E. Hall Martin. Oil paint on canvas. Collection of Oakland Museum of California. Gift of Concours d’Antiques, Art Guild. 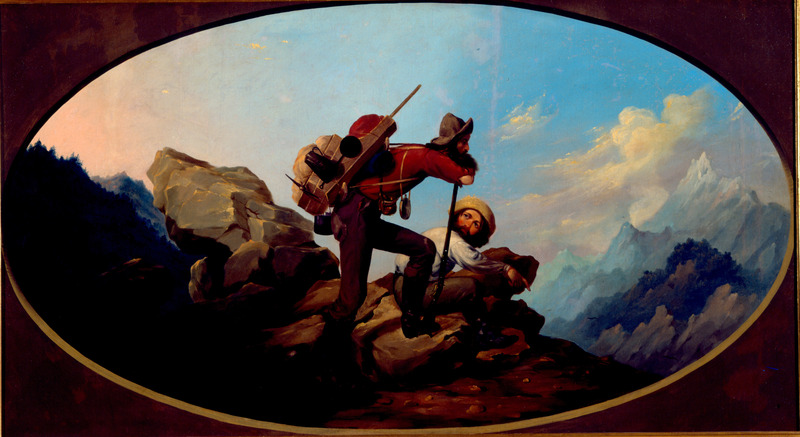 This image depicts a mountain man and a miner on top of a mountain. It is believed that Mountain Jack is the artist’s representation of Six-Fingered Jack, a legendary folk character from Gold Rush lore. The legend of Mountain Jack claims that he was able to point to places where gold would be found.